No images of Smart Energy Group Installations. 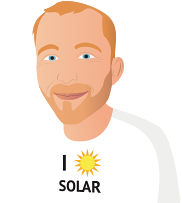 After looking into solar for the past 6 months I called smart energy group and Connor called me back to arrange a time to do a solar viability assessment. He spent roughly an hour and a half at my place in the end we found a 6.4 kila watt system was the best for me. 2 weeks later our installers arrived. Calvin was our installer he was on-time and talked me thorough the process before starting the work. Within a few hours they were done and had showed me how to work my converter and cleared up all their rubbish. I was very impressed with the salesman, Beau, who came to my house and explained the system and how it operates in great detail. I planned to buy a solar system for the last few years but was waiting for the prices to come down and the kW's yo go up. Smart Energy Group offered a very competitive price and an outstanding service when they installed my new 6kW system last month in Newcastle. I couldn't be happier with the outcome. System was installed a while back but so far i've had nothing but good things to say. Anytime i've had any questions its been a breeze, the system is performing as told and my bill is reduced.